Designed with practicality in mind, all of the seats are stackable. 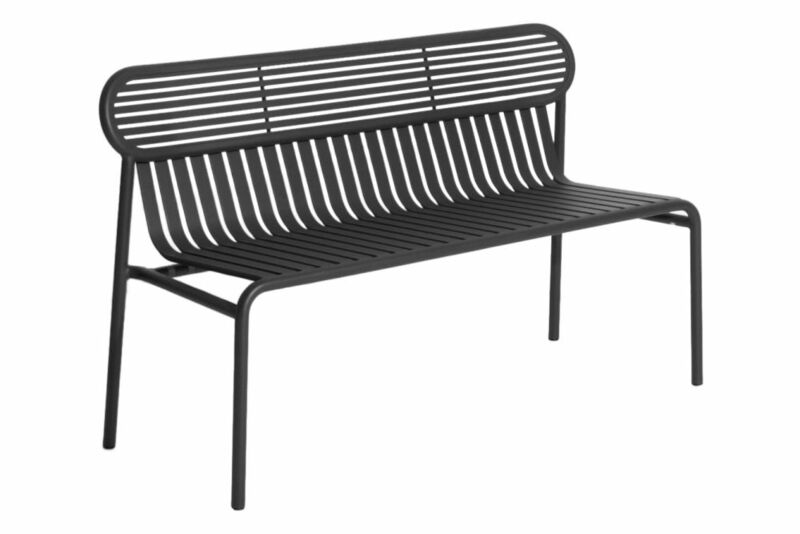 The Week-End collection is a complete range of outdoor furniture. The oval and circular shape drawn by the backrests makes them a graphic statement. The impact of the horizontal and vertical slats, so similar to stripes, highlights the full and empty spaces, asserting the identity of the collection. The Week-End collection includes seats - a chair, a bridge, an armchair, tables - a coffee table, a square table for 2-4 people, a large dining table for 6-8 people. Caroline Ziegler and Pierre Brichet founded Studio BrichetZiegler in 2010. As part of their search to place exchange and dialogue at the centre of their research, it is an open think tank workshop in which poetry, materials and forms express themselves with sensitivity. They collaborate with several furniture and lighting companies, and work on industrial and interior design projects. In 2015, they launched a self made collection when they created the By Hands brand. Working on all scales, with a preference for furniture and design objects, their projects take shape through the people they meet. Colourful and expressive, with a graphic touch, they design evocative and generous objects in which the material is as outstanding as the uses.